A potentially positive outcome of the EU’s two recent Summits is the focus on Africa with increased political and financial commitment, primarily through investment. Sometimes branded as a “Marshall Plan” for Africa, the same ideas appeared in President Juncker’s final State of the Union address. Of course, we know that underlying this new-found interest in Africa is the fear of migration from Africa to Europe which so dominates Brussels debates. Nonetheless, it is happening and could either be shaped to be something positive for Africa and Europe or it could become something damaging to both. There is a lot at stake with the ongoing negotiations on a post-Cotonou framework, the discussion of the EU’s next budget, the review of the Joint EU-Africa Strategy, and the expansion in EU security and defence initiatives in Africa. The way to reach a positive outcome lies not in emphasising the newness but learning from the history of Europe-Africa engagement, which has been taking place for hundreds of years, for good and often unfortunately for ill. In his speech, Juncker talks about a new approach, claiming that Africa doesn’t want charity. Instead it will get investment. The same rhetoric comes out of the rest of the Commission and the EEAS. It is based on the false premise that EU-Africa relations are just about aid. In fact, Europe’s involvement in Africa has been dominated by commercial activities and actors since Europe first “discovered” Africa. Who were the big players in the colonial era? Companies. What was Françafrique about? Charities supporting poor Africans? The amount of time, resources and political attention on commercial engagement, be that investment or trade, often dwarfed the small amount of development assistance. Even in recent times, for most EU Member States their interest in African countries was mainly commercial. The Lisbon Treaty created am EU diplomatic service and foreign policy, but from DR Congo to Egypt Member States have too often been content to let the EU get on with funding and the soft “values” stuff while they get on with the real business – cut-throat battles for contracts. Their newfound interest in the EU’s potential in Africa is partly based on wanting it to play a role in their priority issue – migration control. The newness of European investment in Africa is being overstated, but shouldn’t we welcome it nonetheless? Diplomats from Federica Mogherini down see the value of capitalising on this interest to drive forward EU external affairs. After all, it is true that no-one likes to receive charity, and no-one likes the people who provide them with charity, a facet of human nature recognised by philosophers from Sophocles to Spinoza and hardly surprisingly re-iterated by African leaders and societies today. This could work but it will depend on how it’s done. First, the EU’s plans should be informed by the massive wealth of evidence on how to make investment and trade work for development. As the OECD states “the benefits of FDI do not accrue automatically and evenly across countries, sectors and local communities”; it depends who is investing and in what. For years, the question of whether FDI actually even leads to development has been contested because studies show contradictory results. In many cases there is no benefit to host economies of FDI and it can have multiple negative impacts – environmental damage, shoring up a corrupt elite, generating conflict by benefiting one group over another, and so on. In fact, it can exacerbate the very factors that lead to… the displacement that Europe is panicked about. Recent work concludes that everything depends on who invests, why and in what, “investor character” and “investor motives” as it is put in the literature. Trade policy’s relations with development are even more complex. Rather than dismissing everything done by the development sector as “charity” some of the principles it has elaborated could be applied to investment funding. For example, the “do no harm principle” which developed for a reason: ill-thought out action creates harm. In practice this could mean taking a broader approach to risk assessment in the External Investment Fund. Private investors tend to rely on risk analysis which focused on risk of financial loss however there are multiple tools available that allow for assessment of risk of conflict, environmental damage or corruption, including some developed by the EU itself. Understanding local context is part of development work, and any thorough understanding of impact of external action requires talking to a broad range of societal groups, and opposition, going far beyond the government. That requires a civil society to provide input on local context but also to monitor the risks of investment and where funding actually goes. One way to support an active civil society is… development assistance which often goes far beyond charity from outsiders to support local civil society engaged in governance, accountability, financial transparency, human rights and security work. It’s not surprising that some African leaders have played up the charity angle – and in doing so played the EU. For example, renouncing charity has found a sympathetic ear in Paul Kagame, a leader who has always shown his disdain for NGOs. There are leaders (on both continents) who don’t particularly like an active civil society watching what they’re up to either. Development assistance is also more likely to be subject to scrutiny by parliaments and the media than are investment flows. Second, the focus needs to be on tackling the causes of forced displacement not preventing migration. Too many European policy-makers believe their own narrative of the good refugees and the bad economic migrants and that everybody arriving from Africa fits into the latter category. In fact the reasons for displacement within and from Africa are complex and multi-faceted and vary across time. People move between categories perhaps originally being refugees forced to flee due to persecution then having to move on due to destitution or societal violence. Looking at the main countries of origin of African migrants to Europe arriving “irregularly”, there is invariably a combination of factors not “just” poverty – conflict, societal violence, corruption, injustice, persecution, human rights abuses, etc. Third, for the Marshall Plan analogy to have any value the EU has to have the courage to make long-term investments in addressing these underlying causes of forced displacement. Analysis of recent policies and tools driven by migration-related objectives, including the Trust Funds and bilateral engagement with countries such as Niger, show another approach. They combine some positive efforts, particularly focused on job creation, and some more dubious measures focused on supporting local security institutions to manage borders and otherwise disrupt migratory movement. It is an exchange: control borders (prevent movement of people) and in exchange get some jobs. It would be naïve to expect that relations between Europe and Africa are not transactional in some ways however the risk is that Europe is not getting a good deal. It is not just or primarily the absence of jobs that is leading people to leave: it is indirectly or directly the actions of the institutions that the EU is supporting on the migration side. For example, violent extremism in parts of Africa is driving displacement as much as absence of jobs. Recruitment into violent groups may be in part about the lack of alternative employment, but for 70% of recruits it is a direct response to a “government action” and fuelled by grievances about state abuses or corruption. If people can’t move recruitment is more likely – armed groups (including smugglers) pay. The jobs piece is crucial but there is also an argument for expanding work the EU does on conflict prevention governance and so on, as well as limiting some of the short-term collaboration with abusive institutions. For example, however complicated, the EU’s Common Security and Defence Policy missions in Africa need to focus on long-term development of institutions that are accountable and provide security to their people, rather than chasing smugglers. Even if it means more people moving in the short-term. There is a set of complex and interrelated causes of involuntary displacement and to limit this displacement, either for good humanitarian reasons or bad political reasons, it is necessary also to understand how trade and investment affect these causes. Fourth, the focus should be as much on Europe as Africa. There are European roots to many of the causes of forced displacement in Africa. Currently, one of the most acute contradictions in EU-Africa relations is the co-existence of desperate attempts to reduce migration while at the same time Europe fuels displacement through the arms trade, climate change, complicity in corruption and other actions. Deals with elites to prevent or disrupt migration in exchange for some of Europe’s largesse will not work in part due to demographic change. While the discussion of African demographics in Europe tend to start and end with the idea that every wants to come to Europe, the internal societal implications merit more attention. The youth bulge is already leading to popular protests, opposition, democracy, and a move away from the long-term leaders clinging to power. The other piece that lies in Europe is opening up legal migration. It is the only way to deal with irregular migration in the long term and the only way to have a true partnership of equals because this is important to many in Africa, as indeed it is for Europeans. However, progress remains limited. Fifth, as a recent Crisis Group analysis on EU-AU relations argues persuasively, both sides need to acknowledge that in part the relationship IS about funding. The EU needs to accept that it is a donor and try to be a better one. Certainly for as long as Member States continue to run bi-lateral foreign policies and not allow the EU to become a fully-fledged diplomatic power, then it will often be constrained to be the “payer” and not the “player”: i.e. exerting power through funding rather than as a political actor. This is a role not to be disregarded: the importance of money is demonstrated by the frequent complaints from foreign ministries about the influence that development ministries buy through sitting on the money. Similarly, internal affairs and migration policy specialists wouldn’t spend so much time trying to control development funds if they were insignificant. 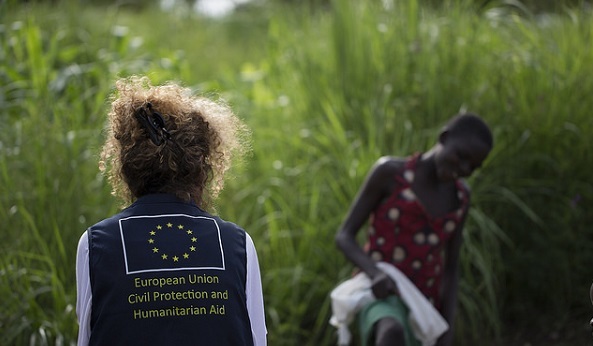 For the EU, being a “good” donor means sticking to the Sustainable Development Goals (SDG), focusing on the needs of the local populations and resisting attempts to divert funds to short-term contradictory objectives. Overwhelming evidence shows that supporting institutions to provide security, justice (including human rights) and livelihoods for populations is the key to sustainable development, which is reflected in the SDG. In some cases, these actions might be unpopular with sections of the state because they are highly political and far removed from charitable giving. The coordination challenges in Africa has often been about the proliferation of European actors present in a particular country. Now, European states and EU institutions are among a multitude of external actors involved across Africa, and not just on trade, with Turkey, China, Gulf States, American states and others involved in security activities as well as traditional economic competition. Many of these actors will not care about whether their investment and support fuels displacement but Europe should and does. One of its comparative advantages is that it can engage for the long-term and it manages, to some extent to engage with populations as well as with states. There may be a way to use the migration focus to improve EU engagement in Africa. But that would be best done by a long-term investment in tackling the causes of forced displacement. Short-term approaches that prevent migration are not the price to pay for this investment – they are a contradictory approach that will lead to more displacement. Facile stereotypes about charity do-gooders and buccaneering development-driving enterprises do not help. Rather, the previous experience of European investment and trade needs to inform policy. Above all, the needs of the local populations – widely understood – most be recognised and factored into all EU response. As a recent study commissioned by the EU itself confirmed, not only does migration policy have little impact on migration it also often has negative unintended consequences. Allowing other policies to focus on security, development or diplomatic objectives, as set out in the Lisbon Treaty, taking a balanced and proportionate approach to migration in and from Africa would be in the EU’s own interest. Otherwise the risk is that it contributes to further displacement.